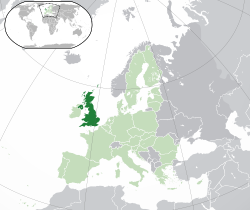 The United Kingdom of Great Britain and Northern Ireland, commonly known as the United Kingdom (UK) or Britain. ↑ 5.0 5.1 "United Kingdom". International Monetary Fund. Retrieved October 2015. ↑ "2015 Human Development Report" (PDF). 14 December 2015. Retrieved 14 December 2015. Letlakala le fetotšwe la mafelelo ka 17:07, 14 Mosegamanye 2017.